“And then get councilman Arancione on the Costa council to give us a business permit for Esti. Bribe the rest of the council.” Merchant Portafoglio sat behind his giant mahogany desk dictating orders to his assistants. “Arancione is not on the Costa council anymore, Sir,” one of the unnamed assistants spoke up. “He was kicked off when Viola and Rosa joined the council last week. Politics in the unnamed kingdom of Simone Luciani and Daniele Tascini’s Council of Four are capricious. One day, you know everyone on the council and things are going your way, the next there are all new faces and you’re lost at sea. Life isn’t easy for a Merchant building his economic empire. But that’s the idea of the game, you have to deal with the ever changing composition of the four councils, and manipulate them to your greatest benefit. Three of those councils each govern one of the kingdom’s major regions, the Coast, the Hills and the Mountains. Each of these regions has five cities where you, as a merchant, want to open shop. But to do so, you have to acquire a Business Permit for that city from the council. Two permits are on display in each region. To acquire one of them, you have to call in favors with the councilmeeple. Yes, councilmeeple! Awesome, right? Four of them sit on each council, and with hand cards in matching colors for each of them you buy a Permit. If you don’t have all matching cards you can replace some with money. Both cards and money are scarce resources, paying either is unpleasant. But you have to spend resources to earn resources. Some resources you earn immediately when you buy a Business Permit. Each of the tiles shows one to three cities where it can be used to build, plus some resources you earn the moment you take the tile. However, you usually want to build in a specific city, and if the permit for another city has better resources you have to make a choice you won’t like. If the councils are not on your side then you do what is tradition in the kingdom: you change the council. Each council has a little paper bench it sits on, and you can bring in a new councilmeeple by pushing it in on the bench’s closed end and make another councilmeeple topple out the other side. You can’t freely change councilmeeple, it’s always the one on the other side that comes out – usually another one that you actually had cards for. At least the councilmeeple going in is so grateful he gives you four coins for your troubles. If you cannot get a permit for the city you need, there is another option to set up shop there: you can control the King’s Council. It works just like the other councils, but instead of taking a Business Permit, you may spend some coins to move the King and then build a shop without a Permit in the city where he ends his move. The effect is the same as using a Permit you previously acquired, you put one of your shops in the city. That’s a lot of trouble just to build a single shop. Is it worth it? On the first one or two cities, you’ll probably say no. Building a shop lets you take the reward from the city. That can be coins, assistants, cards, straight up victory points or nobility points, a secondary scoring track with some bonuses when you reach the right levels. The point is, for a single city it’s not much that you get. But if that city has a road leading to another city with one of your shops, then you take the bonus from that city again as well. And if another road from that city leads to a third city with one of your shops … and so on. As long as your cities are all connected without interruptions, you take the bonuses from all of them again whenever you build a shop in a new city. That’s a simple but effective escalation mechanic. You never have enough of anything at the start, but with each new city you connect to your network you earn more. You can never spend your resources without thinking, the game ends before you ever earn that much, but your options expand rapidly. So you have a strong incentive to only build shops that connect to your network. Most of the time that is what you want to do, but there is a very good reason to build your shop without a connection sometimes: victory points. Bonus points await the first player to build a shop in all cities of a region, or in all cities of the same color. And even more bonus points, a ridiculous number of bonus points, go to the first players to take one of those bonuses. Getting at least one bonus early is an important step to victory, and you will not have time to connect everything properly. More hard decisions to make. 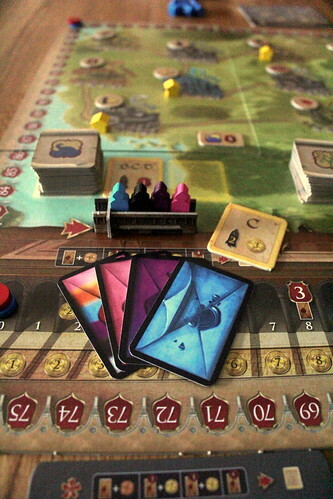 The four actions described above – take a permit, elect a councilmeeple, build a shop with a permit tile or build a shop with the King’s help – are your main actions, you pick exactly one of them per turn. On top of that, you may also perform a quick action. They all involve your assistants in a way. You may pay three coins to hire an assistant, or you may spend an assistant to exchange the Building Permits for sale in a region for the next two from the stack, or you may spend an assistant to elect a new councilmeeple. In that last case, you do not earn money like you would for a main action. Finally, you can spend three assistants for another main action. That last one is tempting, but it is quite expensive, too. And running out of assistants is a very bad thing™ because you also have to pay them when opening a shop in a city that already has shops. How to spend your resources is never an easy decision in Council of Four, not for assistants, not for any of the other resources. Waste them on something you don’t need and you’ll fall behind. Actually, there are no easy decisions in this game, that’s probably why we enjoy it so much. And that’s with rules that are very easy to learn and very consistent, there are no exceptions to anything. Council of Four is also very interactive. Between the bonus tiles you compete for, the Business Permits that you grab under other players’ noses and the extra cost for building in cities that already have shops there are many actions where you get under each others’ feet. One sad downside of the bonus tiles you compete for is that, early in the game, you’re basically forced to enter the race for them because of how many points they are worth. Other early game strategies are at a disadvantage here. But Council is more of a tactical game anyway, and not all that heavy, so I’m okay with this detail. The changing city bonuses every game make sure you have to adapt your tactics. You can also sometimes be unlucky with the cards you draw and the permits available, but almost always that luck is manageable and you don’t lose only because of that. 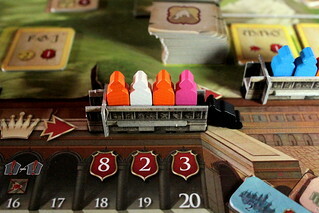 And with the council benches full of meeples, Council of Four also looks good. We’re very happy to have picked up this game in Essen. It’s light, tactical, interactive and its escalation works really, really well that makes it a lot of fun to play.